An employee can transfer his/her PF amount from one account to another account using Universal Account Number (UAN Number), but some of the employees don’t know about how to check EPF claim status online, PF claim status can be checked by an employee after making PF withdrawal. 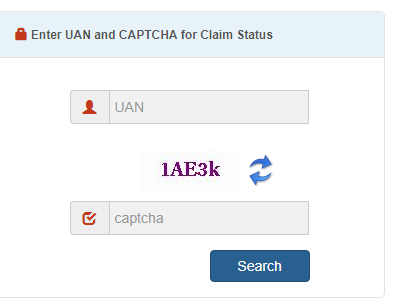 Employee who does not have UAN Number can directly apply for PF claim status online check using form-19 and must attested by any government employee such as bank manager or post man, it is easy to EPF claim status check online by using Missed Call, SMS, UAN Number at http://epfindia.gov.in, below we are given step by step process for how to check EPF Claim Status Online. You cam track PF Claim status through online by visiting http://epfindia.gov.in official website as well as through offline mode by sending SMS or by missed call, below we given step by step process to check PF claim status through online. Then go through FOR EMPLOYEES under OUR SERVICES section. Then refer SERVICES column in below of for employees heading and make a click on KNOW YOUR CLAIM STATUS under SERVICES column. And then you will redirected to a page asking enter UAN Number, fill it with your UAN number followed by given captcha and click on search button. Then click on submit button. that’s it your PF claim status will be show in your screen or you will receive a SMS. In the same way You can check your PF balance by using EPF official Portal. so, follow the below process to check PF balance online. This is same as above procedure, first Then go through FOR EMPLOYEES under OUR SERVICES section. Then refer SERVICES column in below of for employees heading and make a click on MEMBER PASSBOOK under SERVICES column. Then Enter your USER NAME Password and CAPTCHA and then click on ‘Login’ button. If you have activated UAN, you can check your status easily by sending SMS through UAN registered mobile number to 7738299899. the SMS format just like “EPFOHO UAN ENG” and the last three digits of the SMS indicates language. You can also make. Which language you want to receive in the message. so you can choose your language by your own languages such as English, Hindi, Punjabi, Gujarati, Marathi, Kannada, Telugu, Tamil, Malayalam and Bengali. How to Download UAN Card at unifiedportal-mem.epfindia.gov.in?